I have your letter of July 25th regarding the proposed modification of an executive order with regard to the use of material in the manufacture of distilled spirits for other than beverage purposes. 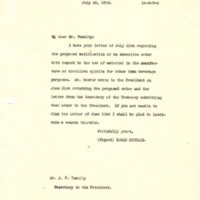 Mr. Hoover wrote to the President on June 21st returning the proposed order and the letter from the Secretary of the Treasury submitting the order to the President. If you are unable to find the letter of June 21st I shall be glad to institute a search therefor. Rickard, Edgar, 1874-1951, “Edgar Rickard to Joseph P. Tumulty,” 1918 July 26, WWP19467, Hoover Institute at Stanford University Collection, Woodrow Wilson Presidential Library & Museum, Staunton, Virginia.